If you're of the opinion that the found footage sub-genre has long ago run out of ideas and steam, you're probably going to have a little bit of trouble with A Night in The Woods, the second feature from Richard parry, the British director of the 2001 South West 9 and the very fine documentary on war photographer Robert King that was the 2008 Blood Trail. This one stars the likeable Scoot McNairy (Monsters; In Search of a Midnight Kiss), up and coming Australian actress Anna Skellern (Siren; The Descent: Part 2) and rising British actor Andrew Hawley (Snow White and the Huntsman; Wuthering Heights). So what's it about? On what is intended to be a fun camping trip to investigate and to chill in the atmosphere of the legendary haunted past of Dartmoor's Wistman's Woods, Brody, his girlfriend Kerry and her cousin Leo very soon find themselves mysteriously ill at ease both with their surroundings and their companions. Bad moods and minor disagreements rapidly lead to feelings of severe paranoia, sexual tension, fear and, eventually, violence between the three friends, a situation that worsens as the evening draws in. At first, they suspect the conflicts are simply the result of being thrown together in the ancient, eerie surroundings, but as night closes upon them each begins to wonder if darker forces are at work. Whether it plays like The Son of Blair Witch or proves to be an original take on the situation that really kicked off the found footage sub-genre in the first place is another matter. 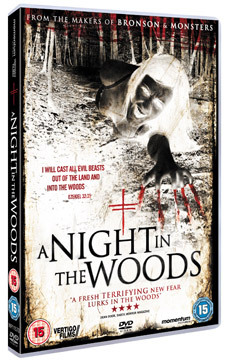 Following its premiere at last year's FrightFest, A Night in the Woods will be released in UK cinemas on 7th September 2012 from Vertigo Films, with a DVD release following a week later on 10th September at the RRP of £12.99. No extra features have been listed. Not yet, at least.